They danced in it, rolled in it, and bathed in it. The honey bees just couldn’t get enough of the rock purslane (Calandrinia grandiflora). Last week when we visited Vacaville’s El Rancho Nursery and Landscaping. nursery, owned by Ray and Maria Lopez, it was like a free-for-all at the French Laundry. 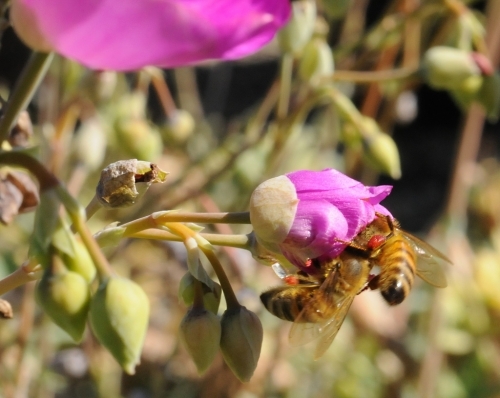 The bees clustered around the rock purslane flowers, waiting inpatiently for them to open. No sign read "Closed" but some of the magenta flowers had not yet unfolded. No matter. A robost honey bee tried to slip inside. What do you mean, I'm too big? Nearby, two other bees, sisters in honeyhood, shared the same flower as another honey bee tumbled happily out of her flower and made a beeline for the next one. 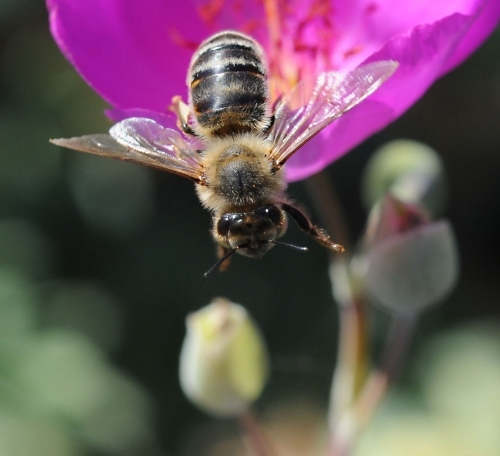 Ernesto Sandoval, curator of the College of Biological Sciences Greenhouses at UC Davis and Robbin Thorp, emeritus professor of entomology at UC Davis, say that bees love Calandrinia grandiflora. The plant, native to Chile, blooms here in late summer and early fall. 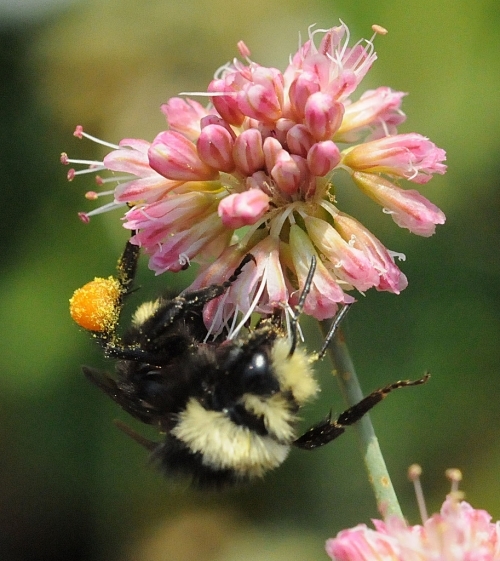 "It has has bright red-orange pollen that honey bees love," Thorp said. What do you mean, I'm too big? Okay, everybody in the pool! You may have noticed the tiny bees--common name “sweat bees” from the family Halictidae--in your swimming pool or pollinating your flowers. They’re attracted to perspiring skin (thus the name “sweat bees”). Sometimes when you’re splashing around in the pool, you’ll feel a sharp but harmless sting. 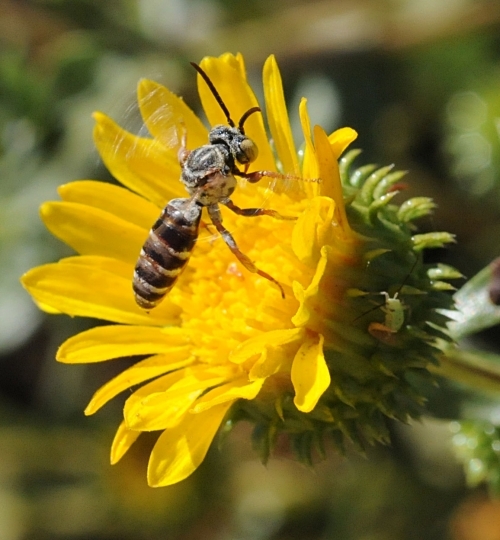 UC Davis emeritus professor Robbin Thorp, who researches native pollinators, identified this one (below) as a Lasioglossum (Dialictus) sp. female. A dull metallic gray, brown or blackish in color, they're found throughout California. They nest in ground burrows. If you want an excellent book on providing native habitat for these native bees, you'll want to obtain a copy of Farming for Bees: Guidelines for Providing Native Bee Habitat on Farms, written by Mace Vaughan, Matthew Shepherd, Claire Kremen and Scott Hoffman Black and published by the Xerces Society for Invertebrate Conservation, an international, nonprofit, member-supported organization dedicated to preserving wildlife habitat through the conservation of invertebrates. For more information, contact the Xerces Society 4828 SE Hawthorne Blvd., Portland, Ore. 92715 or access the Xerces Web site. 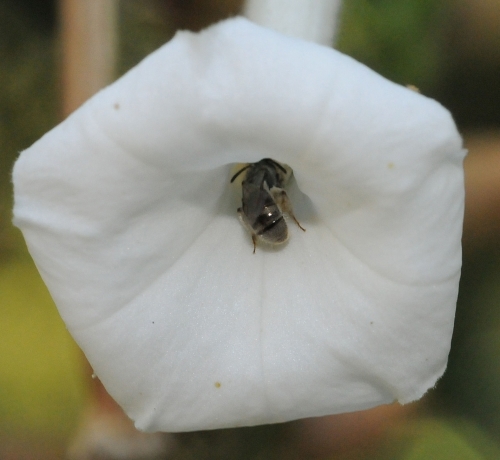 They write: "North America is home to about 4000 species of native bees, most of which go overlooked. These insects are not the familiar European honey bee, nor are they wasps or other aggressive stinging insects." 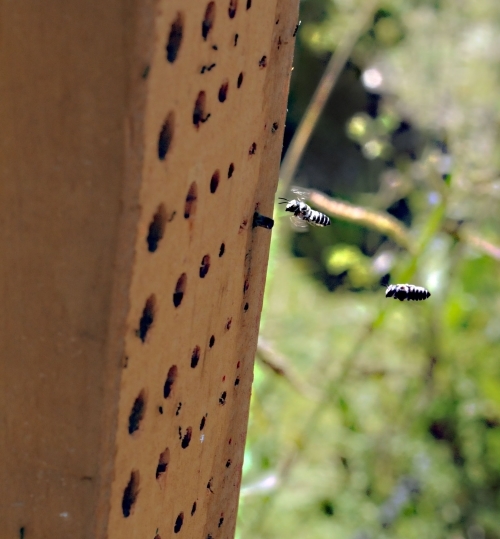 With the decline of honey bees, expect to see more reliance on native bees. The unwelcome visitors were not bumblebees. They were carpenter bees. Carpenter bees? No, they don’t know how to read blueprints or frame floors and walls. 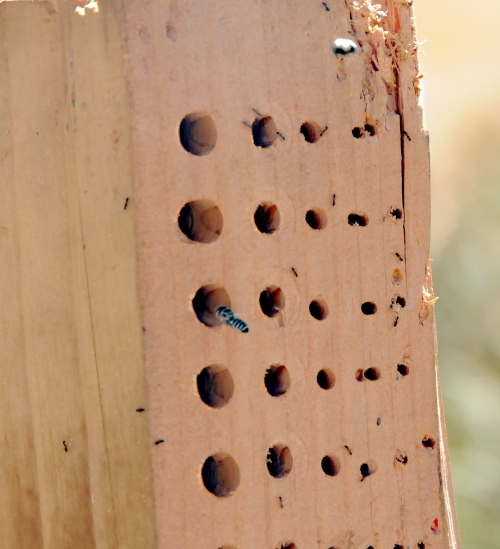 They nest in weathered wood, like your fence posts, utility poles or firewood. They tunnel into your deck, railing, shingles and shutters. They are pests. But they’re also pollinators. 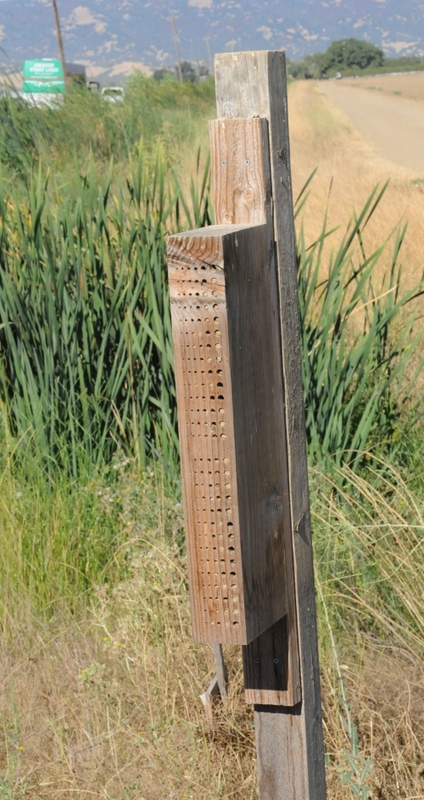 Native pollinator specialist Robbin Thorp, professor emeritus at the UC Davis Department of Entomology, fields many calls about carpenter bees. This one pictured below is a male carpenter bee, Xylocopa tabaniformis orpifex Smith NB, Thorp says. Contrary to popular opinion, carpenter bees don’t consume wood. If you don’t want them around, paint or varnish your wood. You can also plug their (unoccupied) holes with steel wool or caulk, or screen the holes so they don’t return. 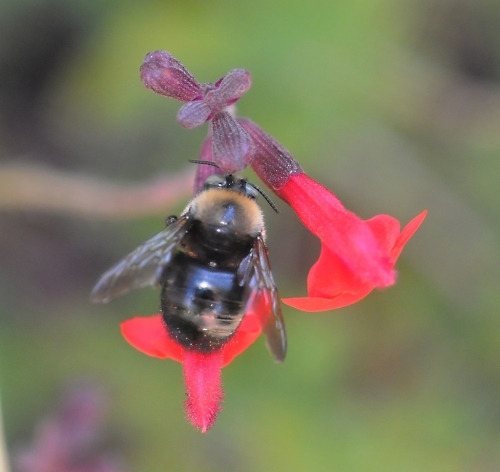 The female and male carpenter bees that nectar the salvia (sage) in our bee friendly garden are about the size of bumblebees. “Robust” comes to mind. Okay, fat. They’re fat. Their abdomens are bare and a shiny black. If you photograph them, you’ll see your own reflection. It’s like seeing your reflection in a black Lamborghini. The female carpenter bees are a solid black, while the male carpenter bees are lightly colored around the head. In comparison, bumblebees have hairy abdomens with at least some yellow markings. 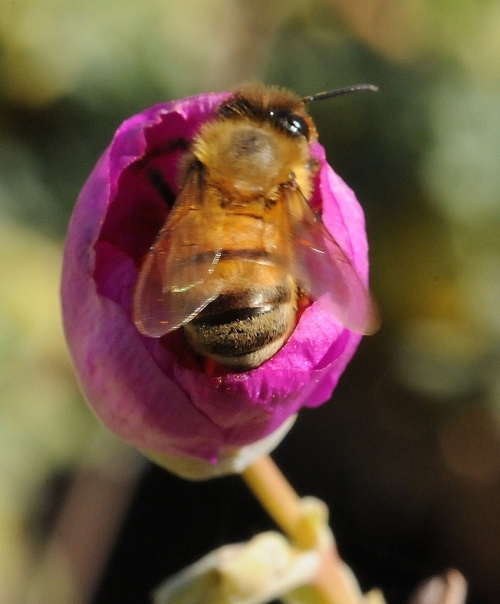 If I were a carpenter and you were a…nah, I’d rather be a bumblebee.